Malaria Season is Upon Us! The rainy season has started in Malawi – which is great for the growing season and agriculture! However, the heavy rains also bring an increase in the number of Malaria cases because there are more mosquitoes. 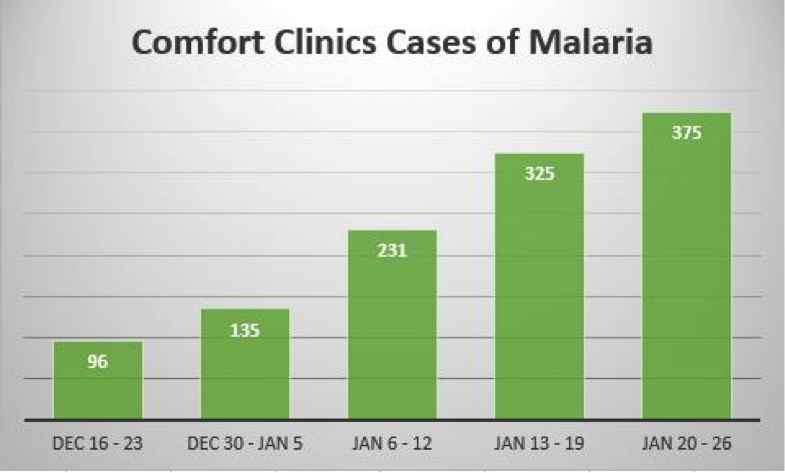 Our out-patient department at Comfort Community Hospital usually sees an average of 50 to 60 malaria cases in a week. However, as you can see in the chart above – the number of cases has drastically increased now with 375 cases last week. This entry was posted in Health Care, News from Malawi and tagged Comfort Community Hospital, Jill Claus. Bookmark the permalink.